I just wanted to let everyone know that I have posted new pictures to the website. These pictures were taken on Memorial Day 2006 at Blackwater Falls in Davis, WV. Cyndi and I decided to stop by on our way home from the Farm (we don’t have many pictures of the falls in Spring/Summer….most of our pictures of the falls are in the winter.). Over Memorial Day weekend, a bunch of family got together in Berea to do some work on the farm and in Berea. 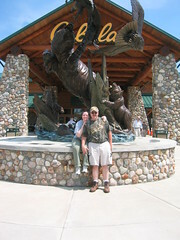 On Sunday, since we didn’t work, we went to Cabela’s in Wheeling, WV. These are pictures of that trip. If you are looking for some pictures taken of the actual clean-up work, my gallery of random pictures from last week has a few (I was working so I didn’t take time to take pictures with our real camera). Cyndi and I went to the farm this past weekend. I ended up with lots of pictures…I should have them posted in the next day or two. When they are up, I'll let everyone know. I just wanted to let everyone know that I have started a new feature. Cyndi and I have a Philips Fun Cam and I have started carying it with me to take some random pictures throughout the week. My newest (and first) series is online. My random pictures from May 22 – May 29, 2006 can be found here. I didn't ride today due to the Memorial Day holiday. I wanted to leave a bit early from work. On another note, I'm working on a BikeStats module for phpnuke. If you want to see what it looks like so far, click on the link over on the left. I still have a long way to go (like a way for users to input their ride stats! ), but I think I'll be happy with it when I'm done. Happy Birthday to the Slurpee today! The Observer (a UK paper) is reporting on a potential problem with a certain strain of bananas. …to judge by supermarket figures, this love of the banana is shared by millions. Sales of the fruit have recently reached all-time highs. More than 95 per cent of UK households buy bananas every week. Only lottery tickets and petrol sales outstrip them. Bananas are us, it seems. The trouble is that this popularity is under threat. According to reports by biologists, the banana could be heading down the road to extinction. Or, to be more precise, the Cavendish – the variety sold in shops throughout Britain – may be en route to oblivion. Why is this? Well, it turns out that the Cavendish is sterile. The trees must be grown from cuttings of other trees. This leads to the plants being very similar. I didn't take a lot of time, but I did try to find out what kind of bananas are eaten in the US. I was unable to find out; however, I came across this article about bananas and plantains that was very interesting.